Are you tired of all this 1080p HD nonsense? Miss the old grainy videos of the 20s and 70s? 8mm Vintage Camera is an iPhone video recording app that gives your videos an aged, classic, specked, soiled, dusted look and feel using a series of film filters and lenses from the olden days that will make your videos stand out in a big way. The app has 5 lenses, 5 film styles, and even a jitter button to add flickering to your videos for that extra added retrograde look. 8mm Vintage Camera runs in landscape mode and has the view on the left side and the buttons on the right and bottom of the screen. Touch the top button to rotate through 5 lenses. You get Clear, Flickering Frame, Spotlight, Light Leak and Color Fringing. What’s amazing is that you can even change lenses while recording. And another impressive thing about 8mm app is that there is no waiting around when you’re done for the app to create the video file, as it processes the video file seemingly in real time and you can watch it instantly when your’e done recording. On the bottom right there are 2 buttons. Touch the small button to change film used in the video. Here you also get 5 choices: 1920, 70s, Sakura, XPro, and Siena. Tap the rounded button on the very bottom to add Frame Jitter to your video in real time. The other parts of the camera are also pretty useful like a flash toggle button for iPhone 4 users, a front/rear camera toggle button again for iPhone 4 people, and a help button for some tips. The videos you record are stored in the app under the My Reels area. The files are presented on a classic wallpaper background which you can flip through. Choose any video and you can watch it right away using the play button. Tap the share button, and you can do one of 3 things: Save the video file to your Camera Roll, Upload it to YouTube, or Send it via Email. As for requests for the next release, here are some ideas. More filters and lenses would be awesome. 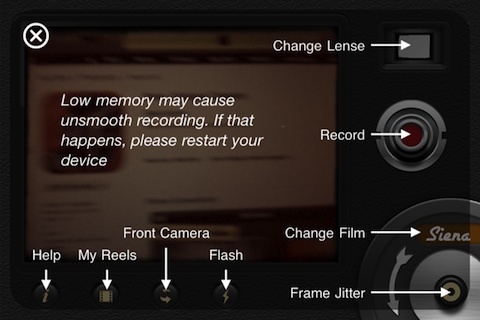 Make it possible to export higher quality video in 720p for iPhone 4 users. The 20s film option is amazing and it would be even better if a “silent movie” option was available that montaged the film with a Charlie Chaplin style piano score. Finally, would it be too much to ask if the app let us save still pictures as well as videos? although there is always Instagram for that. 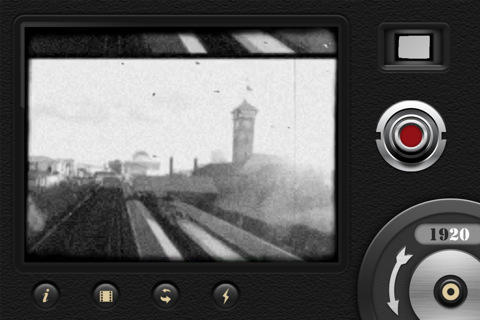 Overall, if you’re in the mood for recording your own sentimental films using your iPhone, or just want to have some fun with a bunch of classic filters and lenses, 8mm Vintage Camera is a wonderful piece of software that you’ll use over and over. AppSafari review of 8mm Vintage Camera was written by Joe Seifi on December 29th, 2010 and categorized under App Store, Art, Featured, Fun, Video. Page viewed 8151 times, 2 so far today. Need help on using these apps? Please read the Help Page. The app records the video with the wrong rotation (on iphone 4) at least. I did multiple tests both holding the iphone horisontally and vertically when using the app. Just an advice: You will be spending a lot of time rotating the video yourself to work correctly from your camera roll or YouTube. I wasn’t able to find out how to rotate the flics after importing them on iPhoto or other means. Would be essential if this is possible.